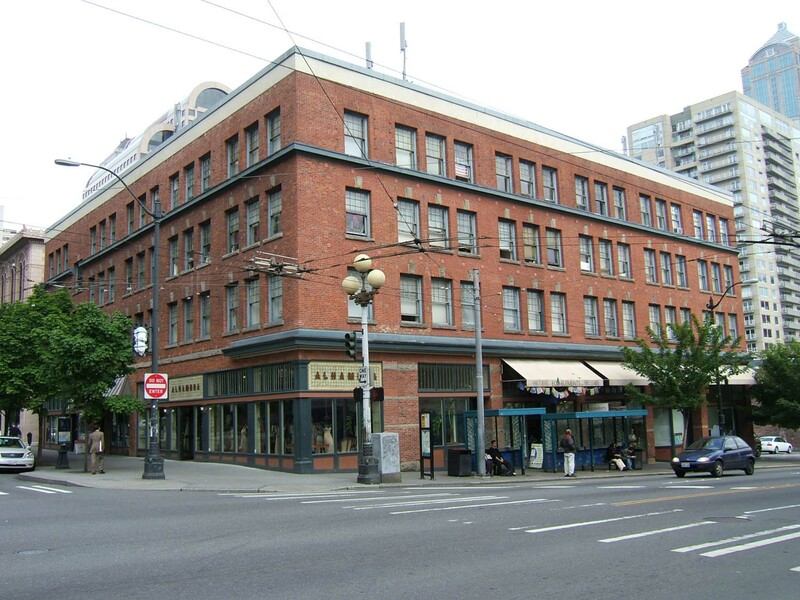 Located at the SE Corner of First Avenue and Pine Street, this former 96-room hotel building includes several retail stores and now functions as an apartment building. It is a four-story masonry structure with a concrete foundation and basement measuring 111’x113’ with six irregular bays at both the First Avenue and Pine Street elevations. It has a U-shaped plan oriented toward the alley (east) and exhibits a modest two-part commercial block façade composition accentuated by red-orange color brick cladding and modest brick and sandstone details. The original wood and metal cornice has been removed. The shaft and the building cap (the sixth floor level) are accentuated by intermediate sheet metal cornices. Windows are primarily set in individual openings in groups of three. Original 9/1 double-hung wooden windows appear to remain in place at all of the upper floor levels. The fourth floor level window openings are accentuated by quoins and window openings at the second and third floor levels include sandstone sills and keystones. Original vertical-pane mezzanine windows and cast iron storefront members (marked “Rainier Foundry, Seattle”) appear to remain in place at the retail storefronts; however the lower portions of the storefront units have been extensively reconstructed. There do not appear to be any intact or architecturally significant interior building features, finishes or public spaces.